The proliferation of biennial exhibitions in recent years has been dramatic. From a handful in the 1990s (such the Whitney Biennial and Venice Biennale) to the large number today (Istanbul, Havana, Bucharest, São Paolo, Gwangju, Chengdu, Sharjah, and a host of others), the biennial format has spread to become a global phenomenon. Enabled by the rise of technological interconnectivity, inexpensive travel, and the concomitant rise of art tourism, the biennial is now a system, a network through which viewers, artists, artworks, curators, and discursive concepts travel, pausing momentarily at specific points in space and time before moving on to the next location. These increases in global presence and connectivity have in many ways shifted the focus from the distinct biennial to what is now called the biennial circuit: by explicitly defining a recurring time relationship while spreading across space at a global level, the biennial format itself acts as something of a rhythm for the art world, showing what happens where and when, as different nodes of the network light up at predictably periodic intervals. Repurposing Bakhtin’s concept from literature to the biennial, and further applying it to the globalized biennial network, goes beyond a localized chronotope to the notion of a distributed chronotope. While a single biennial might serve as a chronotopic time/space intersection, today’s global system of biennials multiplies and distributes these intersection points, creating a network that operates both intra- and inter-chronotopologically. More than just a particular relationship of time + space, the biennial network as distributed chronotope pushes beyond an individual biennial framework, instead operating in the interstitial spaces, the aesthetic and institutional zones between biennials. As such, the system generates an interactive context that influences both the aesthetic content occurring within each individual biennial as well as the institutional systems outside of it, such as other biennials and the art world in general. 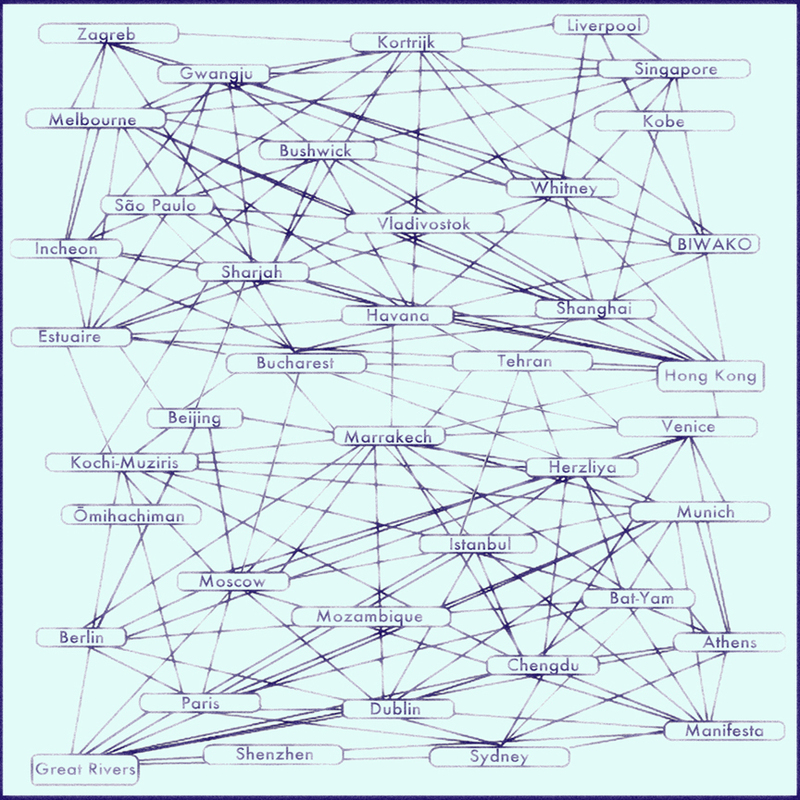 Jason Hoelscher, Dynamic Biennial Dialogic/Chronotopic Network Diagram, 2012, 6×6 inches. Courtesy of the artist. More than just a showcase for art, a biennial exhibition serves as a chronotopic snapshot of a momentarily aestheticized location in time and space, providing not just a showcase of the art of the present moment but also a template for art—and biennials—of the future. However, it is in the way that the biennial simultaneously grounds itself in a global art world context, while also to a degree disengaging from a local context, that makes it a particularly viable model for art experience today. As per Hegel, if a work of art reflects its era and is only truly possible or understandable within that era, when “every work of art belongs to its own time, its own people, its own environment, and depends on particular historical and other ideas and purposes,”[ii] then today’s distributed biennial circuit is appropriate in a number of ways. The art world was less complex in Hegel’s day, when what we might call art experience delivery systems were more basic and statically situated: fine art was most often seen in a church, a government building or a patron’s estate. It makes sense then that Hegel concentrated more on the general, historical context of art than on the particular situation in which it was seen. As breakdowns in locatability have occurred over the past century—speeding up in parallel with increased access to international travel and communication—the same could be said for the chronotopic aspects of the art world as well. The chronotope as a relatively particular, definable point echoes an industrial conception of space/time appropriate to Bakhtin’s era of the early 20th century, a period of discretely positionable institutions like factories, stores and gallery locations. Today’s era of evanescent institutional power, of open-source and proprietary information systems, and neoliberal corporate networks that manage to be simultaneously invisible and transnational, is more amenable to the nomadic, distributed nature of the biennial circuit. Artists and collectives such as the Bernadette Corporation, Seth Price, Kate Gilmore, Eva and Franco Mattes (aka 0100101110101101), Rafael Lozano-Hemmer, and others make use of a transitive network of exhibition contexts that show transitive artworks created by artists increasingly aware of their status within contingent, shifting networks. To give but two examples, Lozano-Hemmer creates experientially distributed works that operate at the intersections of architecture, surveillance protocols, robotics, performance and public space[iv], while Eva and Franco Mattes create networked art that explores issues of digital identity, binary authenticity, intellectual property, and replicability without an original. [v] Both the biennial exhibition context and such artworks shown within are thus precisely articulated enough to be definable and brandable as particular institutional or aesthetic entities, but open enough to engage with and contribute to the larger systems of which they are a part, systems that comprise not just time or space, but both, fused in a fluid, ever-changing relationship across—and between—time and space. It is this notion of the biennial as a transitive, space/time nodal point, existing not only in a quasi-autonomous state of self-containment but also in a reciprocal process of constant communication exchange, that correlates with what Bakhtin called a chronotope, a charged intersection of time and space. However, whereas Bakhtin articulated the chronotope as a dynamic entity, analogous here to an individual biennial exhibition, the global biennial circuit requires an extension of the idea to that of the chronotope as distributed, dynamic system, an entire network that unfolds across time and space. Whether electronic or digital, the definition of a circuit is predicated on the idea of a loop: the electron flow or information signal that pulses through eventually comes back around in some form, thus completing the circuit. Whether or not such recursivity was in mind when the term “art circuit” first came to use, the term is particularly apt when discussing biennials: whether one attends only a single biennial or jet-sets around the globe from one to another, the cyclical, biannual nature lends itself to a circuit model. Some viewers return to the same biennial every two years, completing a circuit across time; those with bigger budgets travel from biennial to biennial, completing the circuit across both time and space. Unlike a solid-state circuit, however, which tends to have one signal component moving through it, the biennial circuit has—at the very least—two major components: the artwork and the art viewer. As these units move through the system they change each other and in turn change the larger system of which they are constituent parts. Dramatically or subtly, the art experience and viewing context change the viewer; at the same time the changing viewers and contexts no doubt affect the art and artist as well. The dynamic interchanges involved in this tripartite system—art/viewer/biennial context—is quite complex even when considering only a single biennial, and is even more so when one factors in iterations of the same exhibition context every two years. Scaling up to consider the spread of biennials around the world, from a single periodic exhibition to many, exponentially amplifies the degree of systemic complexity and feedback, revealing a cascade of dialectical influences and transformations as whorls and eddies of discursive input and output matrices lead to trends and counter-trends, points and counterpoints, between viewers, artists and curators, and across times and locations. Considered in the context of the global biennial circuit, the nodal points Lyotard speaks of operate not only viewer-to-viewer or artwork-to-artwork, but biennial-to-biennial as well, creating, circulating and recirculating pulses of—respectively—intersubjective, intertextual, and aesthetico-institutional information through the nested series of feedback loops that makes up the system in the first place. Add to this the fact that many of the same artists and curators are involved with different biennials over the years and even the boundary between self-similarity and change becomes blurred and hazy: such consistently recurring artistic and curatorial nodal points help maintain a degree of systemic stability even as they introduce systemic turbulence by appearing in variable contexts. Whereas a particular biennial provides a specific context in which art and aesthetic communications occur and reinforce one another within it, it also operates in a larger context in which the biennials themselves feed back between and reinforce one another across time and space as syntagmatic, communicative units in and of themselves. This scaling up of signal exchange, from the individual level of art viewer and artwork to the global, institutional level of the biennial circuit, suggests an additional notion of Bakhtin’s, that of dialogical relationships in which systems of texts, utterances or meaningful activities are intertextually engaged in a relational and reciprocally dynamic system of interaction[vii]. Trends, ideas and concerns curatorially proposed or exposed in the biennial circuit will inevitably feed into the studio concerns of the street-level art world, in turn dialogically influencing the curatorial premises of future biennials as the art world conversation—or dialogue—continues to unfold across time and space. Corollary to the chronotopological and dialogical nature of the biennial system is the contradictorily rigid yet permeable framework of what constitutes a biennial in the first place. Biennials operate within defined curatorial and aesthetic boundaries: for example, for the duration of the exhibition an artwork shown as part of the Gwangju Biennale is categorically different from an otherwise similar work that is not included, if for no other reason than the imprimatur of institutional prestige granted by inclusion. By the same token, an artwork shown in the Istanbul Biennial “is” quite different than a similar—or even the same—artwork shown in the Havana Biennial, due to the differences in institutional focus, context, and audience expectation. Such ontological and epistemological shifts are due in large part to the fact that the biennial is a defined point; a locus of attention and activity strictly demarcated by aesthetic, discursive, institutional, temporal and geographic boundaries. Contrary to these closed qualities, however, a core concern of a biennial is to chronotopologically communicate a snapshot of art at a specific time and place. Communication requires interchange and feedback, and as such the biennial can thus also be described as open to a degree. By this I mean open not just in the quotidian sense of being accessible to the public, but also as a set of open communicative functions within the interwoven complex of discourses that take place between the biennial and commercial art worlds; between biennial, art history, and critical response; between a biennial and the artists who are chosen to create work for it; and between any one biennial and other biennials, whether in the present or future. Perhaps, then, the biennial is neither an open nor closed system, but rather one that transcends a strictly binary, either/or status. Accordingly, we might say that the biennial network exists in a state of dynamic equilibrium, a term that describes a state of fluid stability in which continuous change occurs as a system interacts with its environment, but generally uniform conditions prevail within the confines of the system overall. [viii] An example of this is a biological cell, which undergoes constant metabolic changes and interactions with neighboring cells while staying within the general categorical confines of being a cell: if too static it dies, if too dynamic it changes into something else, growing out of control. A biennial provides a similar example of dynamic equilibrium, in that each iteration of the São Paolo biennial, for example, is different due to varying artists and curators, but is also still recognizable as the same institutional entity and locational context as the previous iteration. Any given biennial might best be considered as operating in a state of dynamic equilibrium, in which it is just closed enough to serve as a conceptual zone of focus for a specific institutional and curatorial reading of the art world at a given time, being precisely defined and bounded enough to possess a coherent identity. At the same time it must also be just open enough to communicate that identity across variable contexts, both locally in a geographic sense and discursively in the art world in general, at what Barthes might call a level of second-order signification[ix], moving out from the local specificity of the event to the meta-level of the event as a node in the biennial circuit. If the system is too closed off or too defined—to viewers or interpretations or both—then it will have no real say in the global, dialogic conversation of the art world: if the meaning is too monologically asserted then there’s no room for discussion or debate. On the other hand, if it’s too open and its conceptual or interpretive boundaries are too permeable, then there’s no specific aesthetic point being put across: it’s just an exhibition with no curatorial focus, not worth arguing, debating or considering over the long term. In both cases, too open or too closed, it’s just an exhibition that happened, but so what? The exhibitions that seem to matter in the long-term unfolding of art world discourse are the ones that provide a chance for discussion and debate. In other words, they are dialogical, prompting a long-term dialogue in the minds of the viewers and in the pages of art journals and reviews. An example of this is the 1993 Whitney Biennial, which quite clearly articulated a specific set of positions regarding social, ethnic, gender and political issues. Love it or hate it, the exhibition is still cited and discussed nearly 20 years later, whereas some of the safer, more recent iterations are likely remembered only vaguely; as Roberta Smith wrote at the time, “In some ways it is actually a better show than usual, simply because it sticks its neck out.”[x] To do this a biennial must not only stake a position, it must also operate right on the boundary between just open enough and just closed enough to allow for a dialogical definition of the chronotopic parameters of the art world at that point in space and time. The physical presence of a work of art, and of a place in which to exhibit it, necessarily occupies space. The signal exchange that constitutes an aesthetic experience—whether Kant’s disinterested judgment of taste or Jacques Rancière’s interested distribution of the sensible—unfolds across time. It is the intersection of these spatial and temporal components that coalesces into the biennial chronotope. An example of these systemic issues can be seen at the level of the individual biennial. The Bucharest Biennale and the Sharjah Biennial are two distinct entities, with coherent, identifiable brands: an attendee will approach each one with a different set of a priori expectations. This defined quality is fluid, however; while each biennial has its own set of genotypic conditions—its innate institutional DNA if you will—that core condition phenotypically manifests itself differently with each iteration: with a different curatorial vision every two years it manifests a distinct chronotopic space/time relationship with each iteration, in resonance (or dissonance) with the art world in general and with other biennial chronotopic nodes in the system. Every biennial is different each time, while managing to remain the same institution. To this system, then, already complex at the 1:1 scale, add a recurring pattern based on a new temporal iteration every two years. Further, duplicate the system spatially around the globe, again in recurring iterations, and you have not just a chronotopic system, but a distributed chronotopic system that operates in a perpetual state of recurring, dynamic equilibrium: an art circuit. Jason Hoelscher is a painter and educator based in Savannah, Georgia, USA. He has exhibited his work in NYC, Denver, Atlanta, LA, Paris, Berlin, Hong Kong, Stockholm and elsewhere, and has essays and reviews forthcoming in the anthology The ART of Critique and in ARTPULSE Magazine. He received his MFA in painting from Pratt Institute in New York, and is currently working toward a PhD in aesthetics and art theory from the Institute for Doctoral Studies in the Visual Arts (IDSVA). [i] Mikhail Bakhtin, “Forms of Time and of the Chronotope in the Novel,” in The Dialogic Imagination: Four Essays, trans. Caryl Emerson & Michael Holquist (Austin: University of Texas Press, 1981), 84. [ii] Georg Wilhelm Friedrich Hegel, Aesthetics: Lectures on Fine Art, Volume I, trans. T.M. Knox (New York: Oxford University Press, 1998), 14. [iii] David Joselit, “Painting Beside Itself”, October 130 (Fall 2009), 128. For more information about art in networked environments, see also David Joselit, After Art, (Princeton University Press, 2012). [iv] See for example Lozano-Hemmer’s work Wavefunction at the 2007 Venice Biennale, http://www.lozano-hemmer.com/wavefunction.php, accessed January 3, 2013. [v] Works by Eva and Franco Mattes can be found at their site, http://0100101110101101.org/, accessed January 3, 2013. [vi] Jean-François Lyotard, The Postmodern Condition: A Report on Knowledge, trans. Geoff Bennington and Brian Massumi (Minneapolis: University of Minnesota Press, 1979/1984), 15. Emphases in original. [vii] Predating by decades the notions of intertextuality put forth by Kristeva and Barthes (among others), Bakhtin’s writings on dialogical vs. monological relationships can be found in Bakhtin, The Dialogic Imagination: Four Essays, as well as Bakhtin, Problems of Dostoevsky’s Poetics, trans. Caryl Emerson (Minneapolis: University of Minnesota Press, 1984), 79-85. [viii] See for example Stuart A. Kauffman, The Origins of Order: Self-Organization and Selection in Evolution (New York: Oxford University Press, 1993) and Michael A. Huston, Biological Diversity: The Coexistence of Species on Changing Landscapes (New York: Cambridge University Press, 1994). [ix] Roland Barthes, Mythologies, trans. Annette Lavers (New York: Farrar, Strauss and Giroux, 1957), 113. [x] Roberta Smith, “At the Whitney, A Biennial With a Social Conscience”, The New York Times, March 5, 1993, accessed January 3, 2013, http://www.nytimes.com/1993/03/05/arts/at-the-whitney-a-biennial-with-a-social-conscience.html?pagewanted=all&src=pm. [xi] Jacques Derrida, “Speech Event Context”, in Limited Inc, trans. Samuel Weber and Jeffrey Mehlman (Evanston IL: Northwestern University Press, 1988), 8. 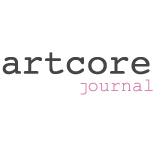 This entry was posted on January 23, 2013 by artcore journal in Volume 1, Issue 2: Biennial and tagged biennial, chronotopic, jason hoelscher, volume1 Issue 2: Biennial.